We are delighted to inform you that the Book Fair is arriving in school very shortly. We have arranged for each class to make a visit to the Fair, providing an opportunity to browse the selection in advance of making any purchase. All parents attending the Parents’ Evenings will be able to visit the Book Fair in the Social Space between 3.40-6.40pm. We have also arranged for P1-P5 parents to be able to visit the Fair at the end of the school day from 3.20-4pm (please see Table 1). All stages will have visited the fair prior to the afternoon invitation. All parents wishing to visit the Social Space after school (except for Parents’ Evening) should enter via the doors at the Riverside Playground. The Otago Street and Kelvingrove Park gates will be closed from 3.20pm. You will be able to exit the school via the Office door at Otago Street or through the P3/P4 door to the courtyard and then onto Kelvinway. Children will also have an opportunity during the week beginning 10th October to visit the Fair with their class to make a purchase should they wish to do so. 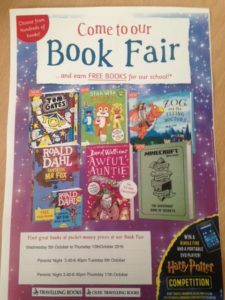 We hope the Book Fair will be very successful, not only in encouraging reading for pleasure and enjoyment but supporting the school in purchasing some new and exciting books for our school library. There will also be an opportunity to apply for a child’s library card at the event for use at Glasgow Life libraries across the city. We look forward to seeing you at one of the upcoming sales!